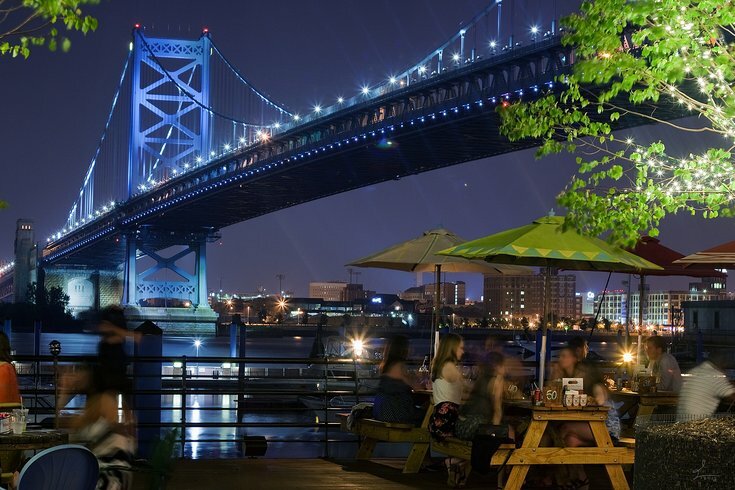 Morgan's Pier, the outdoor drinking destination along the Delaware River waterfront, has announced when it will open for the 2018 season. If you've been anxiously awaiting opening day, you don't have much longer to wait. Soon, you'll be able to sit by the water under a big umbrella to enjoy beer and bites. Morgan's Pier, which was one of the most popular Philly destinations for Uber last year, will open Thursday, April 19. Each season, the backyard beer garden invites a different celebrated chef to take over the kitchen. This year, Adam Lazarick is the chef-in-residence. Most recently, Lazarick worked with FCM Hospitality to create food programs for the traveling beer garden Parks on Tap and last year's Craft Hall Pop-Up at Dilworth Park. Two highlights on his Morgan's Pier menu will be the roast pork sandwich and the sour cream and onion dip. As for entertainment this season, there will be "Yappy Hour" fundraisers with the Pennsylvania SPCA, succulent workshops, game nights, acoustic music, mini beer fests and DJs. Morgan’s Pier is open Mondays through Fridays from 4 p.m. to 2 a.m. on Saturdays and Sundays the the beer garden is open 11 a.m. to 2 a.m.
Mondays through Fridays: 4 p.m. to 2 a.m.
Saturdays and Sundays: 11 a.m. to 2 a.m.